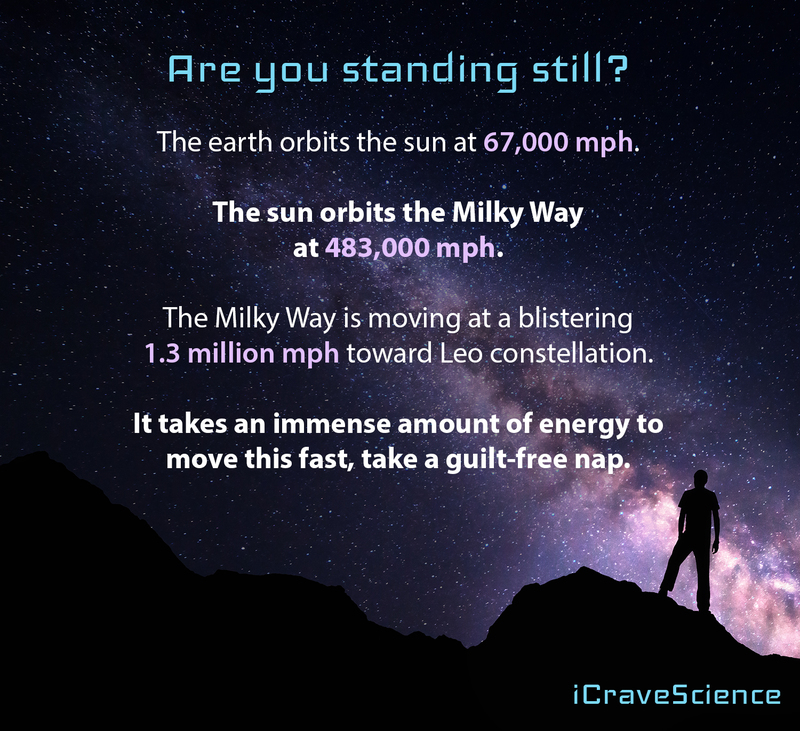 How Fast are You moving through Space? The earth makes one turn on its axis every 24 hrs. This rotation means at the equator a person is traveling roughly 1,040 mph. A person in the United States is roughly traveling 800 mph and England around 600 mph. We are blissfully unaware of these fast speeds because gravity anchors us and the atmosphere to the earth’s surface. Earth is also moving relative to the sun. Earth travels 600 million miles to orbit the sun in one year. To travel that many miles in 365 days Earth is flying around the sun at 67,000 mph. To give some perspective, at that speed it would only take you 3 minutes to go from Los Angeles to New York City. Our solar system is also moving relative to the Milky Way galactic center. Our sun pulls the solar system around the Milky Way at an incredible 483,000 mph. Even at this blistering speed, our solar system takes 225 million years to make one rotation around the Milky Way. Since the birth of the solar system it has only been around the Milky Way 20 times. The Milky Way is immense at 100,000 light years across. NASA estimates we are 165 quadrillion miles from the galaxy’s black hole, demonstrating just how enormous our own galaxy is. The sun is also moving relative to the galactic plane. The Milky Way is disc shaped and our solar system oscillates up and down in the galactic plane as it orbits the galaxy center. Our solar system is currently traveling up out of the galactic plane at 15,624 mph and is now about 50 light years above the plane. The sun’s momentum will carry us about 250 light years above the plane before the gravitational pull from the galaxy will reverse our motion and the sun will start moving back down. The sun will travel back through the galactic plane and down 250 light years in the opposite direction before gravity again pulls the solar system back. Scientists estimate it will take about 66 million years for the sun to reach its current position again. 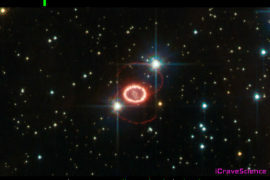 The Milky Way’s movement has been difficult to pin down because astronomers had no reference point to compare against. 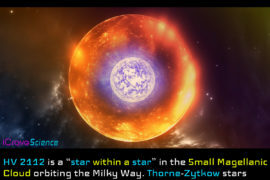 Astronomers couldn’t use galaxies or clusters of galaxies as they are also moving through space. In the 1960s an astonishing discovery was made showing the universe was filled with background radiation. This radiation is leftover from the birth of our universe in the big bang. 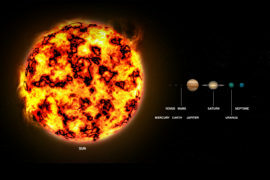 The radiation energy was originally in the form of gamma rays, highly energetic (hot) waves of light, that filled all of space. 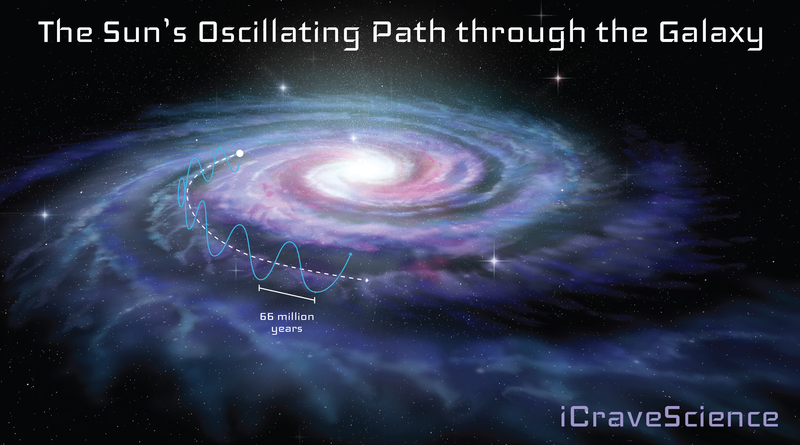 As the universe expanded, the gamma waves stretched, becoming cooler, less energetic x-rays. The universe kept expanding as well as the gamma radiation going from x-rays, ultraviolet, visible light, radio waves and finally the microwave radiation we observe today. With this stunning discovery scientists now had a way to measure Milky Way velocity relative to the Cosmic Microwave Background Radiation, or CMBR. Movement causes doppler shift as evidenced by a siren that is high-pitched as it approaches you and low-pitched as it recedes. The same reasoning was applied when scientists, studying the CMBR, noticed it was warmer, waves compressed, in one direction and cooler, waves stretched, in the opposite direction. After taking the CMBR measurement, scientists concluded the Milky Way galaxy is traveling at an astounding 1.3 million mph toward the location defined by the Leo and Virgo constellations. How fast you are moving depends on your reference point; however, we clearly are not sitting still.